Reports have claimed that Intel will be short of processors for the upcoming 2018 holiday season. They are based on an interview with a JP Morgan analyst, and on a report from a Chinese source claims that the company is reverting from 14nm to 22nm chip production processes. There may be something to them, as AMD's stock is now reported to be rising steadily. Recently, a JP Morgan analyst was quoted as stating that Intel is experiencing a shortage of processors to satisfy the market for the upcoming holiday season. This may be backed up by a report dug up from a Chinese-language website. If the translation holds true, it asserts that Intel have downgraded to the production of 22-nanometer (nm) processors for at least some of its upcoming products. 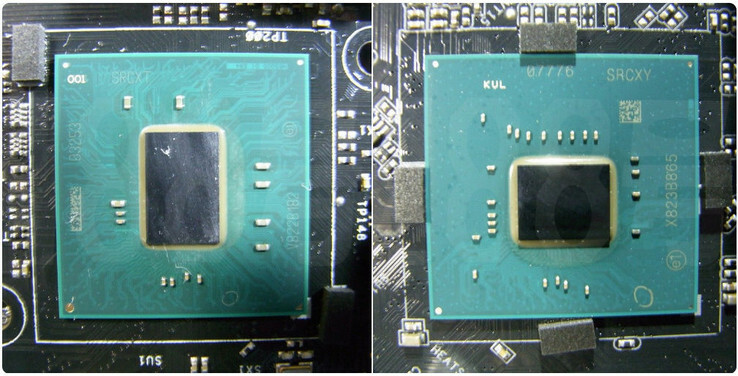 The affected chips conform to the H310C platform, which may be a derivative of the planned H310 processor variants. This line was intended to be associated with dies of 14nm in size. However, according to the report, the H310 launch has been scrapped, and is to be replaced with a 22nm analog. This may be because the use of 22nm manufacturing will cut costs; however, it is also possible that the measure has been taken to ensure that Intel has new chips of any kind to sell. The leak also contains an image, apparently sourced from Twitter, of two chipsets, one of which is supposed to be the H310 and the other the H310C. The 'H310' die is demonstrably larger. Interestingly, the leaker also suggests that the H310C is intended to support the native use of Windows 7. Reports such as these are having an effect on the market. An analyst with the company Jefferies, Mark Lipacis, has raised AMD's stock price target from US$30 to $36 for today's (September 21, 2018) trading. This increased AMD's pre-market share-price value by 0.8%. Lipacis cited the indications that Intel, which was down by 0.78% at the same point, is running short of processor stock in his decision.